If you're wondering if your NVMe drive might need a firmware update, and you're running VMware ESXi Hypervisor, this article is for you. Many affordable, consumer market SSDs only make Windows or Mac utilities for firmware level determination and updates, such as Samsung Magician. I'm hoping to spare you the trouble of finding out that you should have upgraded, the hard way, such as when your Samsung 960 or EVO drive vanishishes after a reboot, due to an older firmware. That whole story unfolded here at TinkerTry first, earlier this year. Note, consumer SSDs are more affordable partly because of their relatively low TBW, and unlikely to appear on the endurance-for-the-enterprise focused VMware Compatibility Guide. That said, they make great VMFS datastores for homelabs, where write endurance is unlikely to be an issue. Not recommend as a caching tier for vSAN. This article gets you through that first step in remediation, determining whether you have an old firmware or not, quickly and easily, without disruption, and without installing any third party software. Works for any NVMe device in any form factor, including HHHL PCIe cards, M.2, and U.2. 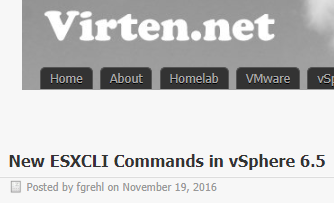 I used VMware ESXi 6.5 Update 1 on my SuperServer Bundle 2 to test this, seen also in the video below. But this exact method should work on any 6.5.x version, assuming you've started SSH on your ESXi host first. esxcli nvme device get -A vmhba1 | egrep "Serial Number|Model Number|Firmware Revision"
then up-arrow and replace the vmhba1 with vmhba2 then press enter. Repeat this process, until you run out of drives to check. [root@xd-1541-5028d:~] esxcli nvme device get -A vmhba2 | egrep "Serial Number|Model Number|Firmware Revision"
[root@xd-1541-5028d:~] esxcli nvme device get -A vmhba3 | egrep "Serial Number|Model Number|Firmware Revision"
press enter, then up-arrow and replace the vmhba1 with vmhba2 then press enter again. Repeat this process, until you run out of drives to check. Yep, it's that easy, you're done here! No downtime, no reboots, quick-and-easy, and completely safe. Just don't forget to close your SSH session and/or service. While it would be nice if your affordable SSD vendor supported the esxcli nvme device firmware download XCLI command from within an SSH session to your ESXi host, that may not be the case. Instead, try to locate the bootable ISO firmware updater from your SSD's support site, such as the Samsung 960 EVO and 960 firmware update ISOs (sometimes) found here. This method of booting from an ISO-based-OS side-steps the need to have an OS installed on new systems. This is why boot ISOs are well-suited for new (greenfield) deployments, where out of band management using IPMI (iLO, iDRAC, iKVM) to mount that ISO can help. If you don't have such abilities, you can always burn an old-school CD/DVD, or create bootable USB media from the ISO. 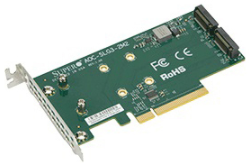 The Supermicro AOC-SLG3-2M2 PCIe for two NVMe SSDs manual is available at Amazon, Newegg, and Wiredzone, see also the AOC-SLG3-2M2 User's Guide and Product Page. The two M.2 NVMe SSDs featured in the video are detailed at Where to buy your Samsung 960 EVO or PRO M.2 NVMe SSDs, featuring the latest ordering and availability info. Note, there are now several companies offering 3D NAND M.2 NVMe storage, including the Intel® SSD E 6000p Series and the (WD/SanDisk partnership) Toshiba XG5. The Shop section was added above, prompted by Bob Watson's comment below. In case you're wondering what an INTEL MEMPEK1W032GA is, that's a 32GB Optane drive, see also Intel Optane M.2 16GB/32GB consumer NVMe SSDs for Windows caching are not that fast as VMware VMFS or NTFS, save up for bigger PCIe versions. More about Optane at TinkerTry soon.